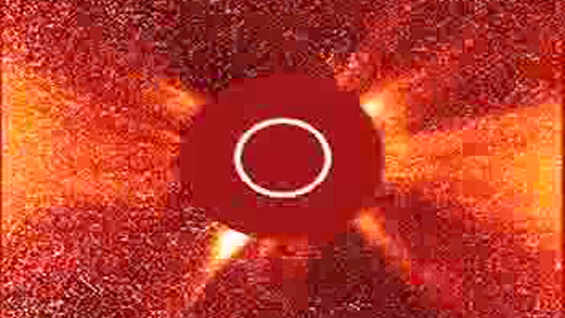 Solar outbursts, known as Coronal Mass Ejections (CME), can represent a hazard to astronauts, disrupt communications with satellites and affect the magnetic environment of the Earth, called the magnetosphere. A recent article provides new evidence that CMEs can also impact the acceleration of matter near the border of the magnetosphere, to speeds higher than 1000 kms-1. This study compares observations from the four satellites of the ESA/NASA Cluster mission with global simulations of the magnetosphere. 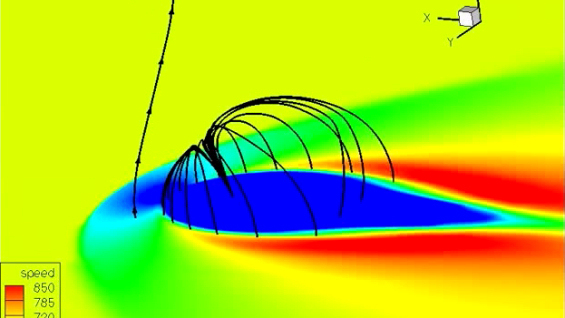 The acceleration process found, which is interestingly not related to magnetic reconnection, predicts an altered coupling of these high-speed flows with the magnetosphere. Animation 1. CME observed by SOHO in November 2001. On 11 January 1997, the AT&T Telstar 401 satellite suddenly fell silent, cutting TV coverage to millions of U.S. viewers. Six days later, after unsuccessful attempts to reestablish contact, the company declared it permanently out of service. A $200 million satellite had been short circuited. The most likely cause of this failure is that Telstar 401 was hit by a massive cloud of charged particles coming from the Sun, known as a Coronal Mass Ejection (CME, see Animation 1). While the Sun is continuously losing a small fraction of its mass via the solar wind, a CME is a massive ejection of matter at high speed, carrying up to 10 thousand million tons of charged particles, or plasma, out into the Solar System. Most CMEs travelling towards Earth are harmless, but some can affect orbiting satellites or even power grids. Understanding how CMEs impact the Earth's magnetic environment - and consequently space- and ground-based technologies - is an active field of research. On 25 November 2001, during the passage of a CME at Earth, the four Cluster satellites were skimming the border of the magnetosphere, the magnetopause, in a region called the magnetosheath, when they detected accelerated plasma up to speeds of 1040 kms-1, while the ambient solar wind speed was only 650 kms-1 (Image 1). Image 1. Strong plasma flows observed by the CIS/HIA instrument onboard Cluster, during the passage of a CME on 25 November 2001.
Credit: Cluster/CIS (ESA) Animation 2. Global MHD simulation of the magnetosphere. Strong bulk plasma accelerations have been observed before with or without the presence of a CME. Usually, these are taken to be the indicator of the occurrence of magnetic reconnection, a physical process by which solar and terrestrial magnetic field lines get mixed up and accelerate plasma. But on 25 November 2001, this was not the case. By combining Cluster observations on that day with related global MagnetoHydroDynamics (MHD) simulations of the magnetosphere, a new study reveals that solar wind conditions characteristic of most CMEs (high magnetic field but modest densities) lead to a mechanism of strong plasma acceleration other than magnetic reconnection. During the passage at Earth of such CMEs, solar wind magnetic field lines get stuck on the front of the magnetosphere before sliding sideways and accelerating plasma in the fashion of a "magnetic slingshot" (Animation 2). "We report new and unambiguous proof that the strong bulk plasma acceleration observed on 25 November 2001 by the Cluster satellites in the near-Earth environment was not the result of magnetic reconnection," wrote Dr. Benoit Lavraud and colleagues in their article published 18 July 2007 in Geophysical Research Letters. Dr. Lavraud is a scientist at Los Alamos National Laboratory, New Mexico, USA. The fact that such large flows occur during a CME passage at Earth implies some alterations of solar wind-magnetosphere coupling that are still to be fully determined. The passing CME may for instance increase wavy/viscous interactions at the magnetospheric boundaries and lead to giant spiral auroral features, e.g. as reported this year by Rosenqvist and colleagues (Swedish Institute of Space Physics, Uppsala, Sweden). "The tremendous progress made by global MHD simulations of the magnetosphere over the past few years has significantly aided our understanding of the Earth's plasma environment. This result neatly illustrates the mutual benefit of comparing global MHD simulation results together with measurements provided by the four Cluster satellites," comments Philippe Escoubet, Cluster and Double Star project scientist at the European Space Agency. Lavraud, B., J. E. Borovsky, A. J. Ridley, E. W. Pogue, M. F. Thomsen, H. Rème, A. N. Fazakerley, and E. A. Lucek (2007), Strong bulk plasma acceleration in Earth's magnetosheath: a magnetic slingshot effect?, Geophys. Res. Lett., 34, L14102, doi:10.1029/2007GL030024. Rosenqvist, L., A. Kullen, and S. Buchert (2007), An unusual giant spiral arc in the polar cap region during the northward phase of a Coronal Mass Ejection, Ann. Geophys., 25, 507-517.